I know what you're thinking: "There is no way I'm going to smear oil all over my face!" Even though it sounds like the opposite of what we've been told to do all our lives, there's actually a good reason these cleansers are now all over the market. That reason starts with an important chemistry rule: "like dissolves like". This means that the oil in the cleanser attracts and dissolves the oil and dirt on your face without stripping your skin or using harsh detergents (like most cleansers do). 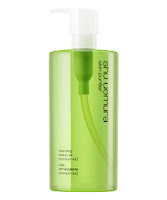 This makes oil-based cleansers perfect for all skin types, especially sensitive and oily types. I know that those with oily skin will have the hardest time with this idea, but trust me - adding oil and moisture to your skin is the best thing you can do to control oil (more to come on this in a later post). Almost every makeup and skin care line now offers oil-based cleansers. Shu Uemura's are by far the most popular with an almost cult-like following, but at $62 or more per bottle, I'll leave it. My favorite is Clean Energy from Origins (pictured above). At $36 per bottle, it's still not cheap but is the best I've tried; it doesn't feel too greasy or silicon-y, and it rinses perfectly clean, taking every last trace of makeup with it. Give these cleansers a try! Most lines will give you a sample to try before you buy, and if they don't, move on! With all the formulations out there, I'm sure you'll find one that's right for you. You'll love how it easily removes your makeup and leaves your skin soft and supple.